Visiting South Africa blew me away – its beauty is undescrible, its vast landscapes are unimagineable and the ‘african skies’ are magnificant. It’s a real shame though that it’s sustainable issues are, in my eyes, desparate. I had heard about people talking about crime in South Africa and had been told numerous times to lock car doors, not walk around at night and not to go near the Townships but no one had mentioned the environmental or social issues I’d see. Here are a few of the insights I picked up on my 2 week travels. 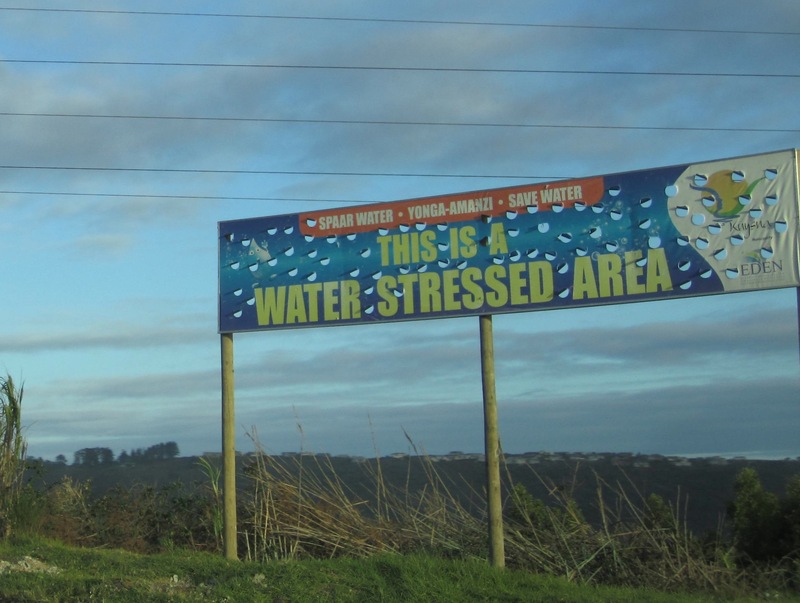 It was interesting coming into Knysna on the Garden Route to see a large banner saying ‘this is a water stressed area’ – the countryside was incredibly lush and it had rained all day! The banners were also posted on rubbish bins and on lamp posts helping them to stand out to people walking or driving by. Although it was good to see someone being environmentally conscious and keen to get the message across but the campaign didn’t appear to be carried out futher. There were no messages to explain how they suggested the locals to cut back on their water use. And, if i wasn’t educated on water use and the environmental problems we face regarding water, I would see this sign as ‘not my problem’. While watching tv that evening, a large star burst flash came up on the screen saying ‘save energy – turn off your television when you are not watching it’. It was definitely eye catching and possibly a message we, in the UK should be adopting. Do the locals take note? Apart from the new buses that had been introduced in Cape Town after the Football World Cup and the local mini bus style taxis (who will change their route to suit customers!) everyone appears to drive. No one commutes by bicycle and trains are hardly used (or seen!). 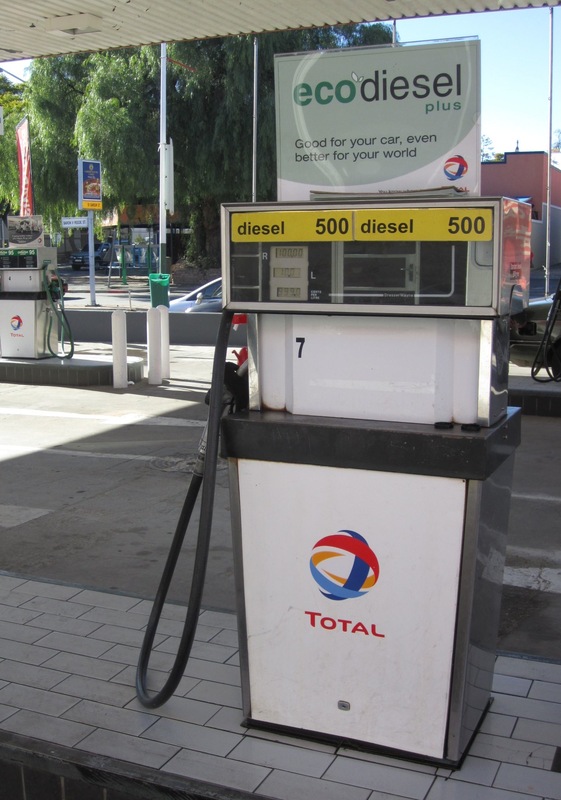 I saw this sign at a petrol station saying ‘eco diesel. good for your car, even better for your world’. You could argue that eco diesel (whatever that really is!) is more environmentally friendly than using unleaded petrol but wouldn’t it better for people to learn how to ‘eco drive‘, car share or encourage better public transport? I found it hard to find many recycling points around Cape Town and the surrounding towns. We did, however go to a farmers market style happening in the Woodstock area of Cape Town and there people appeared to be more environmentally conscious. 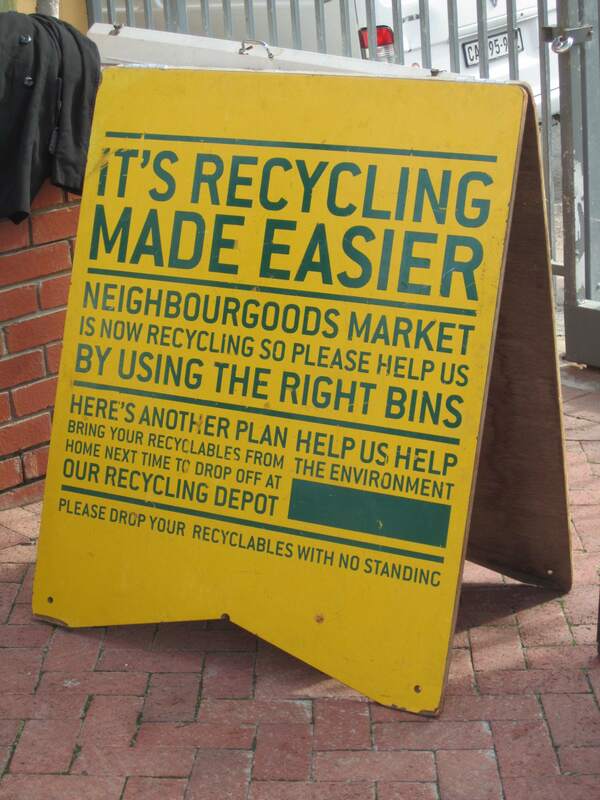 There was a recycling notice stating that the neighbourgoods market was recycling and that there were separate bins to put recycling into. Although the sign was clear, easy to read and placed in a prominent place, I didn’t see the recycling bins and am sure all the rubbish went into one bin…. There is clearly an educational element needed in the city to help people understand the necessity of how to recycle! There was a story on the news one evening about the problem with travelling between Johanesberg and Durban. The train currently takes a large amount of time as does driving, therefore the taxi company have decided to set up a local cost ‘taxi’ airline to fly people between the two towns. Designed to work like a taxi rank, people will line up and get on the next available plane. When people were interviewed to ask their opinion of the new service, there were comments along the lines of ‘the local taxi service is terrible so this won’t work’ rather than ‘we should not be harming the environment by flying’. South Africa, please build a high speed train line before encouraging cheap flights! In Western countries, especially London as I see it everyday, the ‘to go’ coffee culture is bigger than ever. Whether it’s a fashionable thing or a convenience thing, people are buying coffees on their way to work or when they are out and about. The good thing is that people are being more environmentally conscious and buying reusable coffee cups (the KeepCup is a popular brand). Recent research (see Lucy Siegel’s article ‘Are Single Use Paper Cups Evil?‘ in the Guardian) does show however that the energy used to produce and then wash a cup each time does not necessarily challenge the energy used to produce paper cups and recycle them…. 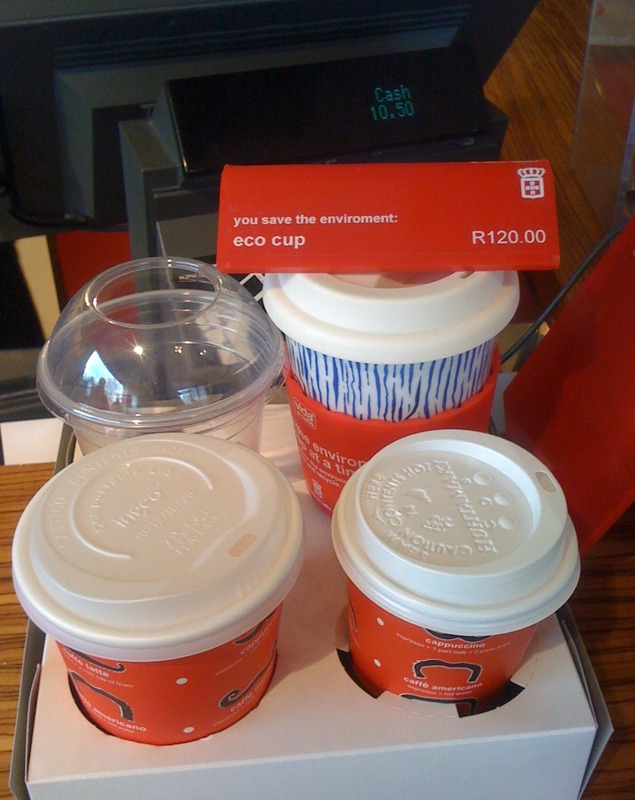 My point here is that there is not the same ‘to go’ coffee culture, that I noticed, in South Africa but clearly the coffee shops either feel they should be selling ‘eco cups to help the environment’ or that it is a good way to make money! Western trends are definitely strong in South Africa. The only place that I saw any type of local art work to do with sustainability was at the airport as I was leaving Cape Town. 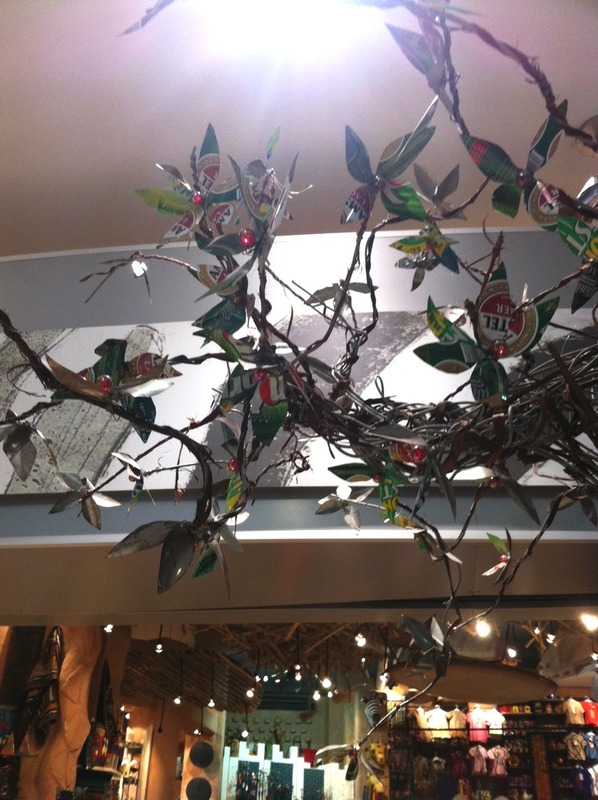 I couldn’t find any information on what the installation was for but someone had clearly designed a fantastic looking tree with leaves/flowers made out of recycled beer cans. Maybe it was a simple way to promote the beer drunk in South Africa….? I’d love to know who produced it. 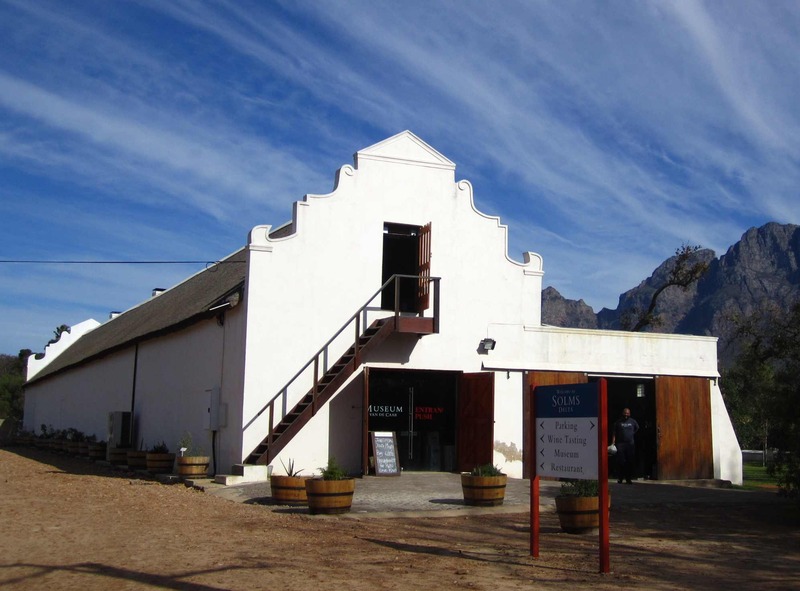 We visited the Cape Wine region close to Cape Town and were really impressed with the Solms-Delta wine estate. I had been to an event the week before travelling to South Africa where Mark Delta (director) had explained the importance of providing a sustainable future for the estate and those working on the estate. He had over come a social problem where the people working on the farm felt they owned the farm but weren’t being heard, by mortagaging his land to buy the plot of land next door for the farmers to own. This way, both the Delta estate and the local workers could work in collaboration with empowered workers for a sustainable future. The estate runs various events through out the year to promote community projects, fundraising and encouraging local collaboration. They also produce a fantastic range of wines (which should not be over looked)! I was shocked at the number of social issues in and around Cape Town. Ignoring theft, muggings etc, the general urban issues that cause everyday annoyance or problems was pretty sad. I was surprised to hear that even though there is a postal service, you are hardly likely to receive any post (unless it is a plain, thin envelope) as it gets stolen before it reaches your letter box! Apparently Amazon do deliver to South Africa now but the service is not regularly used due to the unlikely event of actually receiving the items purchased! 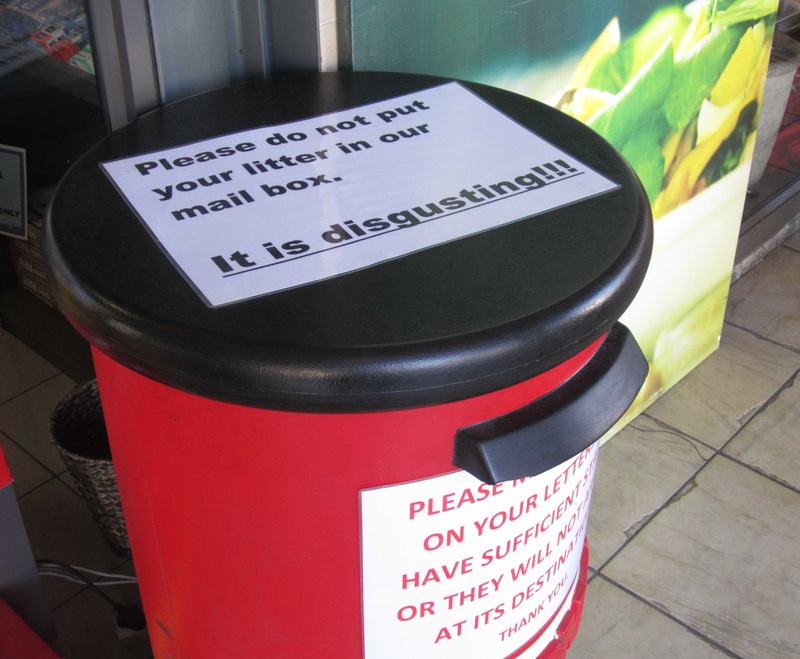 Maybe it’s also a problem in the UK but I noticed a letter box in Cape Town with a sign on it asking people not to put their rubbish in the box. It is clearly a problem which means a notice was necessary. To sum up my trip, South Africa is well worth a visit. I was pleasantly surprised that it is a self sufficient country in terms of produce yet the social issues seriously need some help. The racist attitude and urban poverty were hard to stomach which really need to be overcome for the country to flourish. Environmental education, better communication and western knowledge could really benefit the country and make it even more amazing than it currently is. Have you been to South Africa? I’d love to hear your thoughts. « Are you Good for Nothing?